Win discount coupon worth Rs. 100 with Big Bazaar Holi offers. Participate in the Big Bazaar Holi Game to get discount vouchers for shopping. To make your Holi celebrations more colorful. Big Bazaar has come with special offers for the occasion. 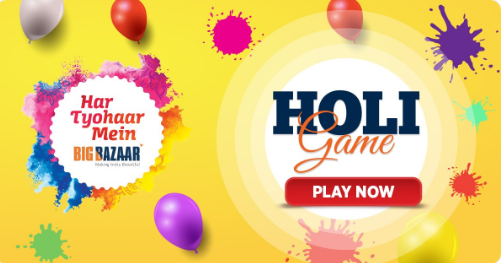 You can win discount coupons by playing the Big Bazaar Holi Game 2019. It is simple only participation can assure you a discount coupon worth Rs. 100. Apart from the interesting Holi Game, you can expect Big Bazaar offers across all categories including grocery, fashion, kids products, etc. Also, check the Holi offers 2019 for the craziest discounts on online shopping. You can also get good value for your used products with Big Bazaar Exchange offer 2019. Note: After visiting the game page, follow the instructions given on the screen. You need to finish the game within 120 seconds to unlock the special coupon. Register for the Holi offers with your number and a unique number. The users need to complete the game within 120 seconds. Get shopping coupons worth Rs. 100. The coupon code applicable on shopping of Rs. 1,000. One number will receive max 1 coupon. The discount coupon can be redeemed at the nearest Big Bazaar. Recently, the customers could get discount coupons with Big Bazaar smart search offer as well. The smart search offer provided users with coupons for their favorite category of product. This time the future retail store has come with a more interesting offer to celebrate the festival of Holi. The store may also announce Public Holiday Sale on Holi to make your shopping experience more affordable.